Six Louisiana teams advanced to the championship bracket at the Deep South Bayou Duals on Thursday afternoon at the Baton Rouge River Center. Come the conclusion of Thursday's wrestling, though, none were vying for the 1st or 2nd place trophies. Jesuit won Pool D and Brother Martin's "B" team won Pool F. Those two teams, as well as the remaining six pool winners, automatically advanced one spot to the quarterfinals. The second-place pool teams were placed in the first round of consolations with a chance at placing third. Jesuit and Brother Martin "B" both lost their quarterfinal duals. Jesuit lost 34-27 to Altus, OK, which placed third last year. The Blue Jays six match winners were Sam Drevil, Adam Larriviere, Eli Larriviere, Nathan Koenig, William Rosevalley and Brandon Greer. On Friday, the Blue Jays will meet Belle Chasse, which scored a first consolation round victory over Cypress Bay, FL, 48-27. Starting at 145 lbs., Belle Chasse ran-off five straight pins by Anthony Berlinghoff, Christian Jovany, Josh Edwards, Bryce Fisher and Zachary Edwards, before accepting their first forfeit at 195 lbs. That gave the Cardinals a 36-0 lead, which became insurmountable due to a 3-point win by Cypress Bay and another forfeit for Belle Chasse at the very end. Bryson Falcon put an exclamation point on the win, giving the Cardinals 42 points with a forfeit yet to be scored. The Brother Martin "B" team lost 52-22 to Westmoore, OK. The Crusaders will nest meet Arlington, TN, which defeated Arnold, FL's, Arnold High School. Arlington and Arnold each won four matches, but Arlington's wins were all by falls while Arnold had one pin, one Major Decision and two regular decisions. Teurlings Catholic is still vying for third after a 43-34 win over St. Amant in a "pin fest." Nine of the 12 matches resulted in pins: four for Teurlings Catholic and five for St. Amant. Each also had a major decision, but Teurlings won a regular decision match and accepted two forfeits. Catholic faced South Paulding, GA, and started what appeared to be a very strong team. But not strong enough for South Paulding, who won 10 of the 14 matches in a 51-21 match. 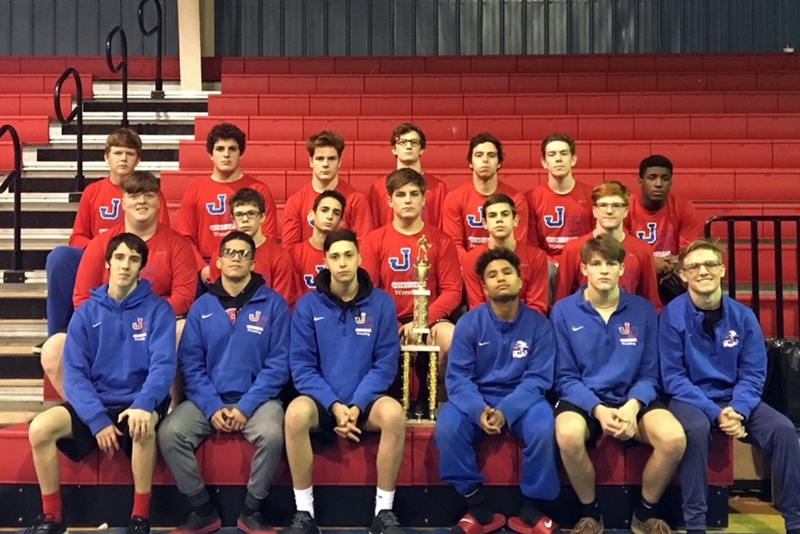 John Curtis proved how valuable consolation wins are at the Evangel Holiday Classic on Thursday. 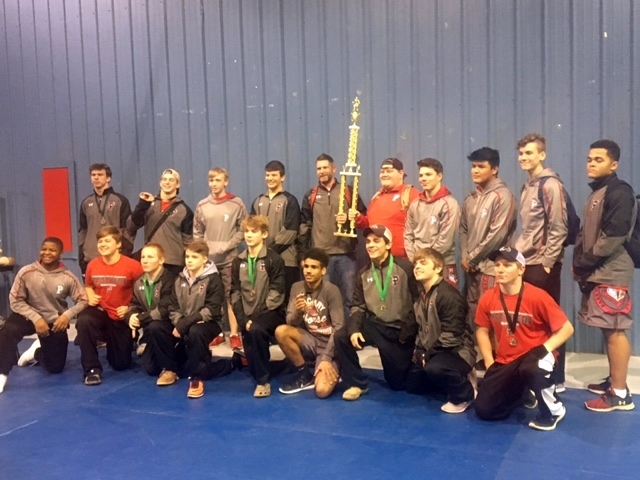 The Patriots placed second to Parkway, which had four champions, but beat the team from Shawnee, OK, which had three champions. Most of Curtis' points came from six third-place winners, two fourth-place finishers and one fifth-place winner. Curtis' winner was Jesse Melan at 220 lbs. Parkway had champions in Zachary Harper, Trey Fontenot, Matthew Pitts and Dalton Driggers. Upper weight classes: D.J. Monroe, Haughton, 195 lbs. Parkway's Dalton Diggers and Arlington Lamar's Dylan Hovers. Brother Martin, with 109 points, leads the Prep Slam tournament by 22 points over second-place St. Anthony. St. Paul's is currently in fourth-place. The Crusaders have five wrestlers in the semifinals: Daniel Varnado at 106 lbs., Luke Cotton at 120 lbs., Steven Shields at 126 lbs., Nathaniel Perdue at 182 lbs. and Mack Brown at 220 lbs. Nine Crusaders are still "alive" in the consolation rounds. St. Paul's has four wrestlers remaining in the championship side of their brackets. They are Cole Houser at 126 lbs., Jared Thieler at 132 lbs., Shane Ulfers at 138 lbs. and Grant Hughes at 145 lbs. The Wolves also have nine wrestlers in the consolation round.